The WIU FMEA Blog | Follow the research of the Western Illinois University FMEA lab students & faculty. Follow the research of the Western Illinois University FMEA lab students & faculty. After years of running a website and managing two blogs (this one among them), I decided it was time to start fresh and consolidate everything I do into one, new digital domain: The Evolving Paleontologist. First, I want to thank Heather McMeekan of Western Illinois University for getting me started in the blogosphere with Jurassic Journeys. For the time being, you can still access the posts and pages here, although this site is now not unlike a fossil — it remains fixed “in stone” as it was. Second, this site will be departing — I will now update student news and research at my new page, The Evolving Paleontologist. Thanks to everyone who has followed or contributed to this blog, and I look forward to rejoining the blogosphere as the Evolving Paleontologist! Just a brief post to let those interested know that Dr. Bonnan has a new blog, Along the Backbone, that acts as a discussion site and feed router for a podcast series on the evolution of vertebrate anatomy through deep time. Just a short post to draw attention to a new article in Nature on the evolution of sauropod dinosaurs from small animals into giants by Fredric Heeren. I feel privileged and honored to be among the many paleontologists featured in the article. Among the many paleontologists cited in the article are close colleagues and friends Adam Yates and Matt Wedel. There are nice interactive graphics as well. It is a wonderful feeling as a scientist to have your research featured in such a prestigious scientific publication. Thanks to Fredric Heeren for a good, informative article on the early evolution of these amazing giants. As Paul Barrett best puts it in the article, the sauropodomorphs are “the unsung members of the dino community”. The Hanksville-Burpee Quarry, June 2011. You can see the small vehicles and people at the left center of the picture, and the Henry Mountains off in the distance to the right in the photograph. If you haven’t been following already, check out Dr. Bonnan’s tweets from the field and more @MattBonnan on Twitter. Dr. Bonnan going to the field … and tweeting too! I am preparing to go back out to the field and continue my work with the Burpee Museum (Rockford, Illinois) in Hanksville, Utah. Four WIU FMEA students will be joining me in the field: Chirstine Gardner, Hillary Parks, Collin VanBuren, and Shannon Worstell — look for pictures and/or movies of these students in posts to come. We will be in the field from June 7-20, so stay tuned. I am also now on Twitter (@MattBonnan), and I’ll be “tweeting” in the mornings and/or evenings (we don’t get cell phone signals in the field) about anything newsworthy from the day. 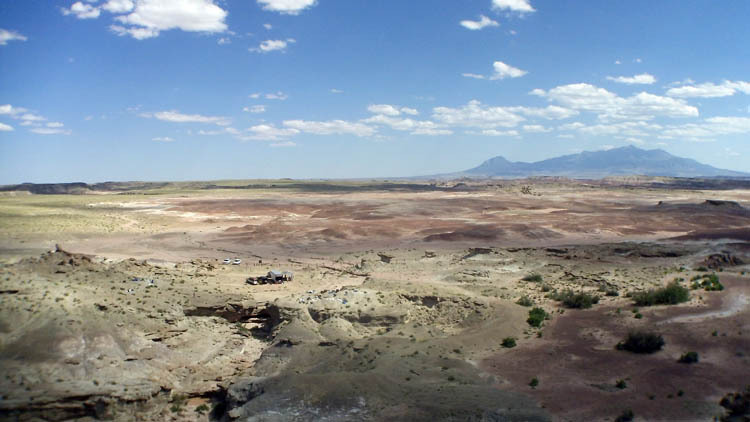 For those who may be new to the FMEA Blog and the Utah Dig, see the background information on the Hanksville-Burpee quarry and search Hanksivlle, Burpee, WIU, Jurassic, and sauropods at the Jurassic Journeys blog. A new paper by Timothy Rowe, Thomas Macrini, and Zhe-Xi Luo entitled, “Fossil Evidence on the Origin of the Mammalian Brain,”should be of interest to our students and anyone who has wondered about the origins of mammalian smarts. For more information on this fascinating topic, stop by Dr. Bonnan’s Jurassic Journeys blog about it. Burpee Museum of Natural History Blog Blog of the Burpee Museum in Rockford, Illinois. Department of Biological Sciences at WIU The webpage of our department. Jurassic Journeys Dr. Matt Bonnan’s Jurassic dinosaur research blog. Penchant 4 Paleo Former FMEA Student Ashley Morhardt’s blog. Pick & Scalpel The Larry Witmer lab blog. Society of Vertebrate Paleontology The major North American society for vertebrate paleontologists. Understanding Science & Evolution Dr. Bonnan’s evolution website. Understanding Science & Evolution [Jurassic Journeys Version] The abridged, Jurassic Journeys version of Dr. Bonnan’s evolution website.